Nvidia made a surprise announcement this week. No, its not that TITAN Xp graphics card. Yes, it will definitely appeal to serious gamers with near unlimited budgets, but let’s be honest, Nvidia one-ups itself on a fairly regular basis. The real shocker is the other announcement that came with it: Nividia would be releasing beta Mac drivers for its GeForce 10-series chips based around its Pascal architecture. Nvidia has released its own Mac drivers in the past. The MacBook Pro I’m currently using is using the Nvidia driver rather than Apple’s own. The interesting part is that the newest official Apple machines capable of using these cards are the 5,1 model Mac Pros released in the middle of 2010 and updated in 2012. These machines are nearing the end of their lifespan, have outdated I/O and honestly, the owners are not likely to upgrade them with modern video cards. These cards are not meant for the Mac Pro. Where does this leave us? With two very grey markets. The first is Hackintoshes. While not a huge market, Apple’s lack of a up to date tower has left some niches of Mac users to take matters into their own hands and install MacOS onto DIY computer hardware. Since Intel’s desktop and mobile platforms usually share an architecture, and thusly drivers, its possible to make some fairly update to date and power homemade Mac clones. There are plenty of resources on the web, so I’m not going to tell you how. The one catch has been the graphics cards. Since Nvidia has fallen out of favor with Apple as of late, there have been no shipping Macs or graphics card beyond the 900 series. 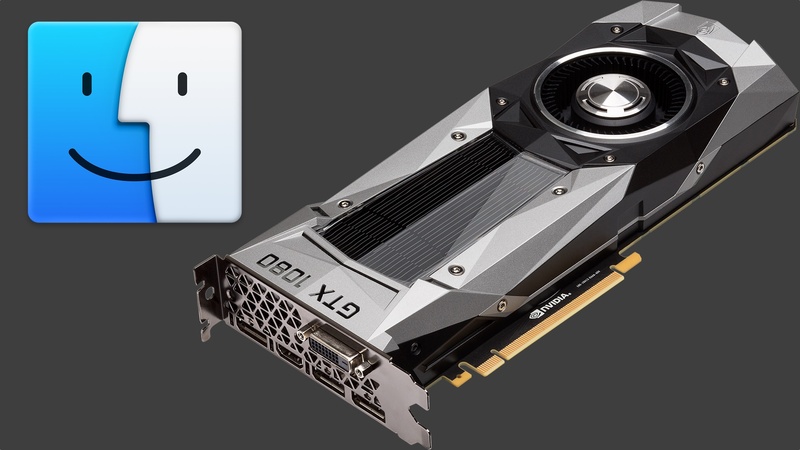 The Pascal drivers allow those Hackintoshes the latest and greatest 10-series cards in Nvidia’s stables. Hackintoshes aren’t the only Macs the could benefit from the 10-series. With the advent of Thunderbolt 3, external GPU solutions for laptops are finally accessible. Not only that, but since the bus is bidirectional, TB3 can allow the eGPU to use your laptop’s own screen. There’s two catches. 1) The external enclosures tend to cost almost as much as the graphics cards themselves. This isn’t an option for the faint of budget at the moment. 2) Apple does not support external graphics options officially or otherwise. While there are options to enable external graphics support through terminal commands, if you fry your new $2500 MacBook Pro, you’re on your own.